Great post. I was livid when I read about this. Tuesday should have been a special day for everyone, and if there’s ever an occasion for making some common-sense exceptions, this was it. As you noted, the complexity of the permitting system effectively precludes any restaurant from applying for a last-minute exemption. 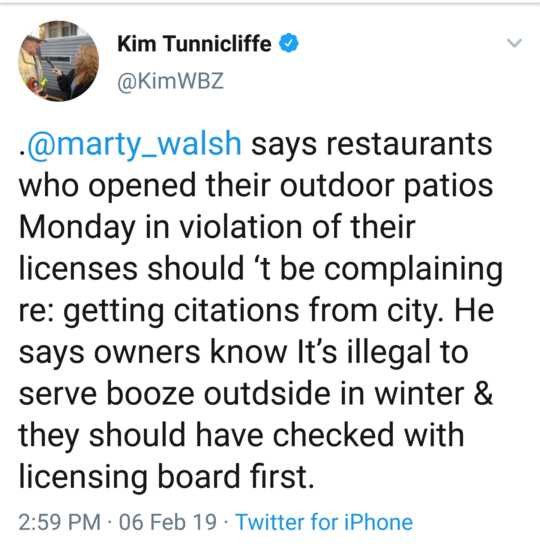 Rules are rules, but I don’t think a few patios opening for a few hours was the most egregious thing that happened during the parade. I hope Mayor Walsh does the right thing and waives these citations. Did you all notice the beers flying around, being drunk on the duck boats, the wine/liquor bottles on the other duck boats? Where was the Boston PD then? Please reconsider fining and bringing these businesses before the licensing board. 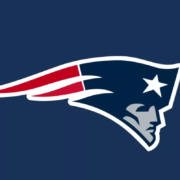 As stated above there were beer drinking and throwing and the police were not pursuing it because the Patriots were enjoying it. It was a beautiful day with such a festive occasion so I think a warning would have sufficed. Businesses will now know not to do this. Let’s give these businesses some slack and cancel the hearing. And why is there such a regulation anyway. If you have a beautiful day in the winter, why can’t you sit putside and eat and drink alcohol? What makes it different in those months? Would love to know the reasoning behind this regulation.